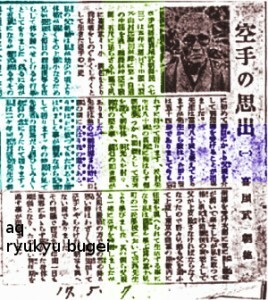 “Karate no omoide” (My Memories of Karate) by Kyan Chōtoku was published on 1942-05-07 in the Okinawa Shinpō Newspaper. The year depends on the method of age calculation that Kyan used. In the traditional method called kazoe a person is counted as one year old at birth, and at the turn of the year he gets one year older. Therefore, if Kyan used the traditional kazoe method, his 16th year would have been 1885. Otherwise it would have been 1886. Or in other words, he received instruction from Matsumura Sōkon until 1887 or 1888. According to this, Matsumura Sōkon passed away 1893 or 1894. Furthermore, this would mean that Kyan went to Tōkyō in 1888 or 1889. So this would have been either 1895 or 1896, again, depending on the method of age counting. So there’s a little internal discreprancy within the provided dates. Anyway, this is not a big deal. When he wrote the text, or when he interviewed for the article, he was 72 years old, or 73 according to traditional kazoe. However that may have actually been: just as in the testimony of Yoshimura Chōgi, Kyan Chōtoku also testifies that he has learned Gojūshiho directly from Matsumura Sōkon. This entry was posted in Prewar Okinawa Karate, Unknown Ryukyu and tagged Karate no omoide, Kyan Chotoku, My Memories of Karate. Bookmark the permalink.